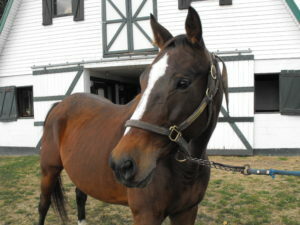 “Silver Cliff will stay with us here at Blackburn,” said TRF Herd Manager Sara Davenport. “He was originally adopted from us and is happy at Blackburn. He easily, made a full recovery and is perfectly healthy now. In fact, he is one of the heaviest horses in the herd. According to Davenport, two mares that came in with yearlings on them have also recovered well at Blackburn. With Z Camelot and Princess Megan leaving, Blackburn took in two more mares. L C Mystery and Golden Thief arrived in November and December, respectively. 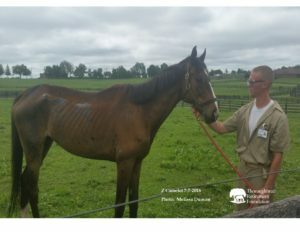 “All of these horses were on Ulcerguard, and we thank all of the people who donated this and other supplies for them,” Dyer said. “We still have some horses that are on it and the veterinarian has told us they will probably have to live on it for the rest of their lives. 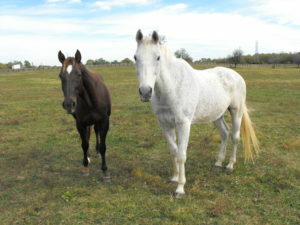 To contribute towards the continuing care of these horses, please donate to the Thoroughbred Retirement Foundation.